Despite common perception, Weather events have not increased over time… but observation & recording have. Maybe having 39,309,017 people (who consume 38 billion gals of water/day) in a semi desert area, may have something to do with it. 1739-40 A severe frost that continued from Christmas Day, 1739, to February 17th, 1740. Temperatures dropped to -9C at one point. 1933 48 hours of continuous snowfall. 1940 The Thames froze for the first time since 1880 and Sheffield saw 4ft of snow. 1946-1947 The cold spells continued until March which saw heavy snow. 1962-1963 Saw the coldest weather for two hundred years. At its height a 36-hour blizzard caused heavy drifting snow in most parts of the country. Over the last few years the UK has been subjected to a number of major flooding events; we are told these are ‘unprecedented’ & due to ‘global warming’. York floods, Xmas 2015 reported as ‘unprecedented’ at 5.2m. : but in 2000 it was 5.4 & 1625 they had 11m. The river Ouse caries millions of tons of silt & gravel every year, but the Environment Agency (EA) has cut the amount of dredging in the area over the last 10 years, reducing the capacity of the river to cope with any sustained rainfall. The Foss flood barrier failed on Boxing Day because the EA had put all the electrical gear BELOW known flood levels. !! http://coolgeography.co.uk/A-level/AQA/Year%2012/Rivers_Floods/Flooding/York%20Flooding.htm You couldn’t make it up. York was undergoing periodic winter floods at the end of the Roman occupation (coincidentally ~ the end of the Roman Warm Period; a climate change – too many chariots perhaps ?? ) around 400 AD; it has been flooded almost every year since. 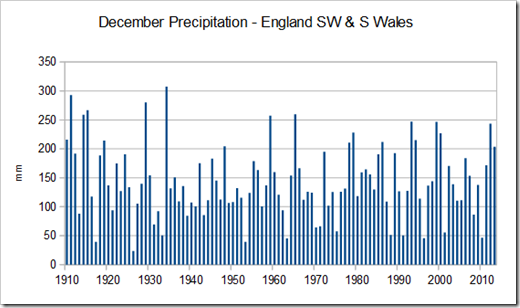 The Somerset levels 2014 ~ 65 km² was submerged because of high, but NOT exceptional (see precipitation chart ?) rainfall, coupled with 20 years of the Environment Agency refusing to dredge the rivers Cary, Yeo, Tone & Parrett, arguing that it is ‘anti-environmental’ !! In 1919, 280 km² was submerged, but that was a saltwater storm surge coupled with reduction of dredging in the First World War. 500 year old Tyne Bridge in Newcastle collapsed from a massive flood, 12feet above high water (in 1771). Catastrophic floods & high rainfall are nothing new, and there is no evidence that “climate change” had anything to do with any of the above, they are just extreme weather events. The 10 worst British winters ever …. (1684 was the clear winner). Finally: – Here’s an example of the two, most dreadful British Winters of the 20th century.